Nowhere are the traditions of Brazil's African-background community as strong as in Salvador, the colorful, historical capital of Bahia state. Head to Mercado Modelo and Shopping Barrafor some retail therapy. Your itinerary includes some good beach time at Praia Farol da Barra and Praia do Porto da Barra. Explore Salvador's surroundings by going to Boulevard Shopping Camacari (in Camacari), Itacimirim Beach (in Itacimirim) and Guarajuba Beach (in Guarajuba). There's lots more to do: wander the streets of Pelourinho, take in the exciting artwork at Ferrao mansion house, look for gifts at Salvador Shopping, and take in panoramic vistas at Elevator Lacerda. For more things to do, photos, where to stay, and other tourist information, read our Salvador trip itinerary planner . Use the Route module to find travel options from your starting location to Salvador. In February in Salvador, expect temperatures between 35°C during the day and 29°C at night. Wrap up your sightseeing on the 12th (Tue) to allow time to ride a ferry to Morro de Sao Paulo. One of the island of Tinhare's five villages, Morro de Sao Paulo stands as an old, charming settlement, with plenty of natural attractions and all the facilities to make visitors feel at home. On the 13th (Wed), enjoy the sand and surf at Terceira Praia, then stroll through Quarta Praia, and then take in the architecture and atmosphere at Igreja Da Nossa Senhora Da Luz. Get ready for a full day of sightseeing on the next day: stroll through Praia do Mirante, enjoy the sea views from Farol do Morro, and then kick back and relax at Gamboa Beach. To see traveler tips, other places to visit, more things to do, and tourist information, you can read our Morro de Sao Paulo trip builder app . You can ride a ferry from Salvador to Morro de Sao Paulo in 1.5 hours. In February, plan for daily highs up to 35°C, and evening lows to 29°C. On the 15th (Fri), wrap the sightseeing up by early afternoon so you can ride a ferry back home. Most visitors remember their Itacare vacation by the area's wide beaches, lapped by breakers ideal for both experienced surfers and novice wave riders still perfecting their skills. 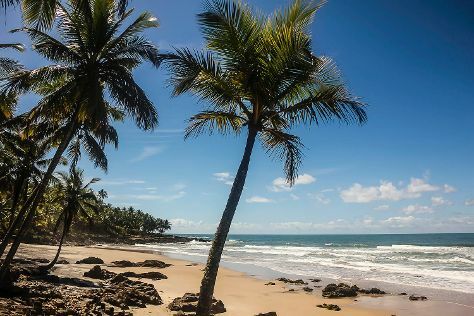 Start off your visit on the 16th (Sat): make a trip to Passarela da Vila, tour the pleasant surroundings at Jeribucacu Beach, and then enjoy the sand and surf at Itacarezinho Beach. Get ready for a full day of sightseeing on the 17th (Sun): look for gifts at Loja e Atelier E IDEIA, then kick back and relax at Concha Beach, then take some stellar pictures from Ponta do Xareu, and finally enjoy the sand and surf at Prainha Beach. For where to stay, ratings, other places to visit, and tourist information, you can read our Itacare online trip planner . Do a combination of ferry and bus from Morro de Sao Paulo to Itacare in 5 hours. In February in Itacare, expect temperatures between 35°C during the day and 27°C at night. Wrap up your sightseeing by early afternoon on the 18th (Mon) to allow enough time to travel back home.